Elixel.co.uk (digital creative agency, Plymouth, Devon, UK). Controlled Frenzy (Creative Prototyping Consultancy, Plymouth, UK). Air Quality Monitors: Elixel and Controlled Frenzy worked together to create low-cost air quality monitors with a vision to run a pilot in schools to raise awareness of poor air quality in the city. It’s no news that air pollution can affect the health of the public – exposure to poor air quality can be attributed to more than 5% of deaths in England alone. Towards the end of January it was reported that London hit level 10 on the Daily Air Quality Index, which caused widespread discussions and concerns about the air we breathe. During this time, we were already underway working on a not-so-secret project for Plymouth City Council’s very own DATA Playinitiative. DATA Play is all about opening up Plymouth’s data and creating an environment where people are encouraged to play and experiment with this data to benefit Plymouth and its residents. The 5th installment was held back in December 2016 and focused on Health and Wellbeing challenges. The hardware itself is made up from a couple of key components including an Arduino 101 programmable board with bluetooth enabled, a sensor capable of recording fine particulate matter (PM2.5) in near real time and a rechargeable USB battery. The companion app is equally simple, but has to reliably transmit the sensor data to a remote server – even when the app is not running in the foreground. In addition to this, it also provides the user’s geolocation with the PM data so a location can be attributed to a particular reading. We used the Ionic framework to quickly prototype the app together and the Mapbox mapping libraries to visualise the dataset. 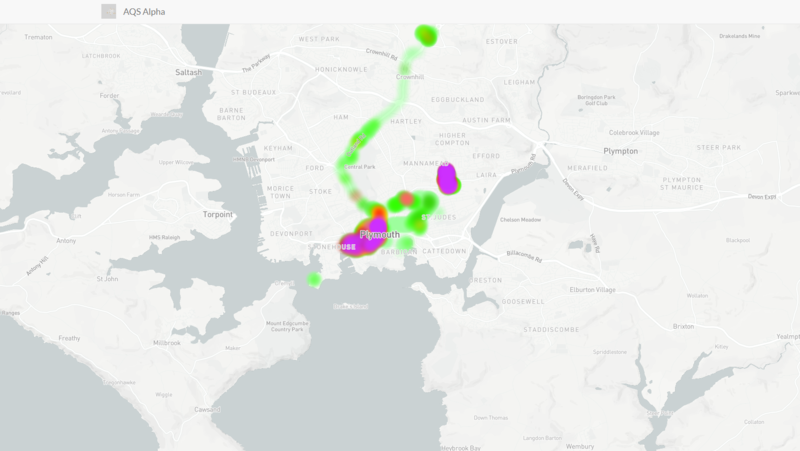 This allows us to have hyper-local air quality readings and provide us with all of the data we need to start visualising an approximate air quality index for areas within Plymouth. To visualise the air quality index, we adopted a portion of the UK Daily Air Quality Index scheme, excluding the other four pollutants not being collected. As DATA Play is all about open data and providing useful data to others, the data collected is automatically published to thedata.place as an anonymous open dataset. This will allow anybody else to work with the data in their own way and provide for the open data community. So, exactly how accurate is the data we are providing? Existing air quality monitor equipment costs in the hundreds and thousands, so how can we construct a prototype for a fraction of that cost? To answer these questions we ran tests against an industry standard tool for measuring PM2.5 around a fixed circuit (You can see the results of this from our dataset around the Union Street region). Whilst the readings we have been receiving on our prototype are not completely matching up with the comparison equipment, there is a very clear and visible trend as to the spikes and fluctuations in particulate matter. What we have produced isn’t a full-on replacement for high grade equipment, but creates opportunities for community based data collection on a mass scale. Hopefully by crowdsourcing and relaying this information, we will allow people in the future to adjust their habits not only by the routes they take, but also in the methods of how they do so. Elixel is a digital creative agency based in Plymouth, Devon. They specialise in website design, mobile app development and branding. Controlled Frenzy is the creative prototyping, software development and research consultancy of Christopher Hunt . Chris works with clients to develop engaging audience-focussed technology prototypes, products, and installations to explore their data and ideas so they can grow and adapt to new ways of working, communicating and doing business.